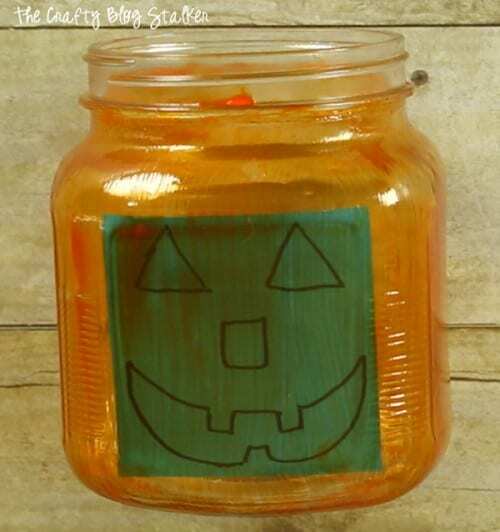 Add a cute painted glass pumpkin jar to your Halloween Decor. 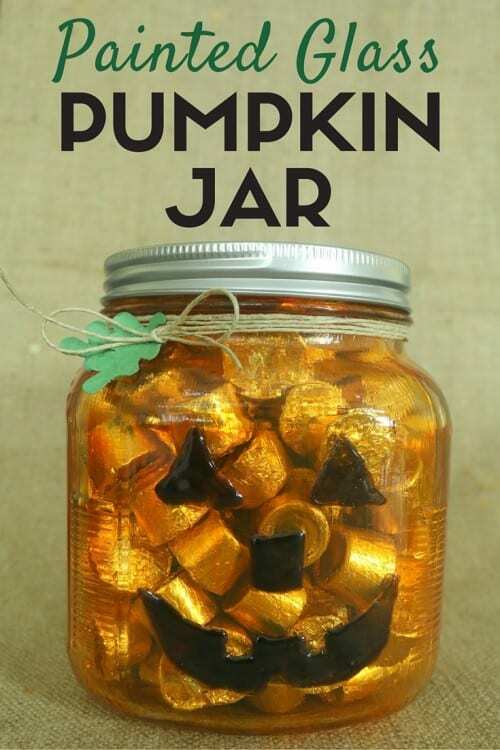 A simple DIY craft tutorial idea that will be the talk of your Halloween Party. 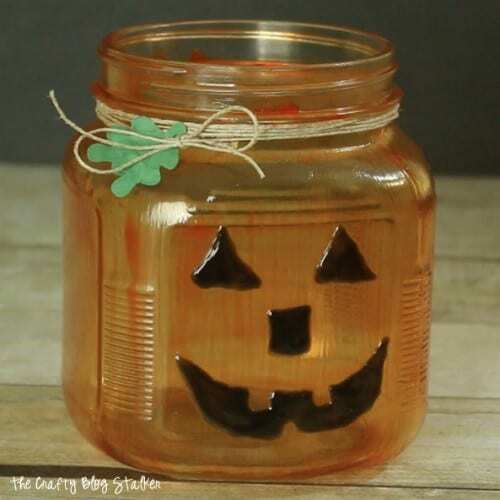 This cute glass painted pumpkin jar has really got me thinking and reminiscing about Halloweens past. Halloween really is one of my very favorite holidays, but I have never really been big on decorating for the holiday. Sure, I would do the obligatory carved Jack O’Lantern, but I never did a lot besides that. This year, I have really gotten into the Halloween spirit and I can’t stop making fun projects and Halloween decor to put in my home. In fact, I have a plan for an entire Halloween themed mantle that I will be sharing soon. 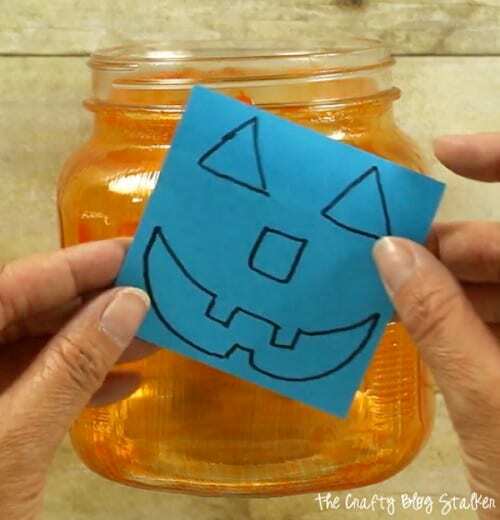 You can get started on your Halloween decorations with this fun pumpkin jar too! He really is pretty simple to make and you don’t need that many supplies. Start with a pretty big squirt of the orange Gallary Glass on the jar. Then paint it on with a foam brush. 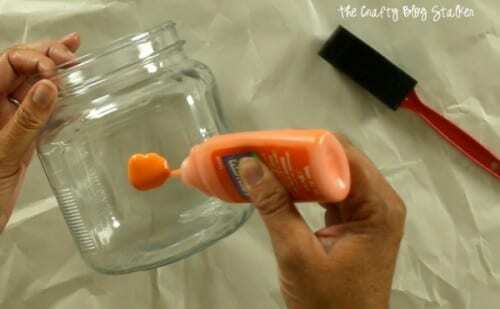 You want to keep the paint pretty thick while keeping the jar pretty evenly coated. When the paint dries you will still be able to see the brush strokes and that is okay. I kind of like the streaks and think that it adds to the pumpkin look. 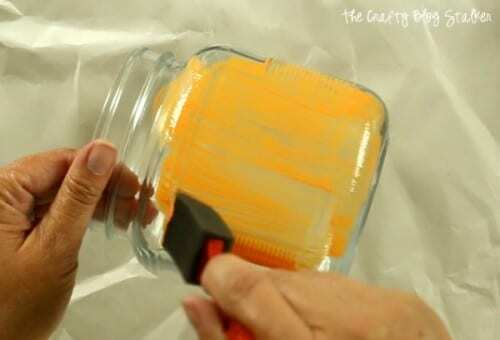 Paint the entire jar with up and down strokes so the paint streaks are all going in the same way. Look at how pretty the jar is when that Gallary Glass is dry. 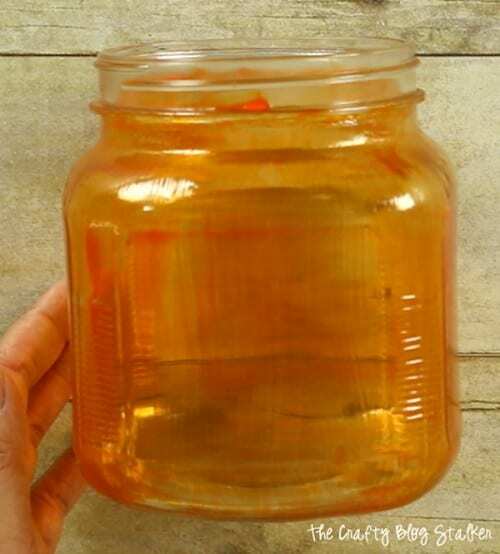 The paint becomes this gorgeous orange translucent color. The next step is to add the Jack O’Lantern face. I drew the Jack O’Lantern face on a Post-it note. BUT, I drew it on the back side of the note so that it would stick to the inside of the jar and I could still see the face. That is now my pattern for the face. I used the Black Gallery Glass and colored in the eyes, nose, and mouth following the pattern from the sketch on the post-it note. The Black Gallery Glass goes on gray, but when it dries it is a very nice dark black. Perfect for a pumpkin face! When he was all dry I took some twine and wrapped it around the top of the jar several times, strung on a couple small paper leaves, and tied it all into a cute bow. I am totally in love with this cute face!! What is your favorite thing about Halloween? Share and leave a comment below. 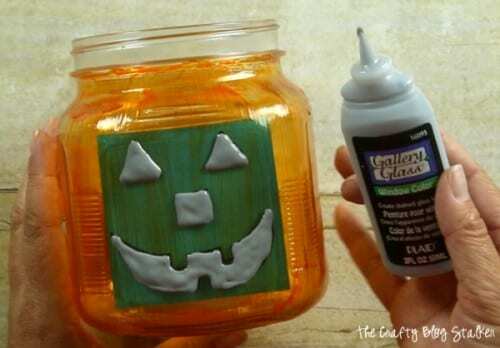 SAVE HOW TO MAKE A PAINTED GLASS PUMPKIN JAR TO YOUR FAVORITE DIY PINTEREST BOARD! Jeannette, You should start! Be a game changer! Hugs to you! Jackie, I am so glad that you like it. You are going to have so muhc fun making it! I would love tos ee what yours looks like when it is finished. Shoot me an email at [email protected]. Such a cute idea! Thanks for sharing it at the Thursday Favorite Things! You are welcome! I am glad you like it. Thank you Linda! So kind. I love the puff paint idea to make the eyes/mouth. I may do a variation of this technique for my Dia de los Muertos decortions. Erlene, Thank you. I am glad that you like it. I would love to see your decorations when you are finished with them. Very cute and simle. Thanks for linking up to Merry Monday! Sharing on ! Have a great week! Thank you, Kim! I am so glad you liked my little painted pumpkin. Thanks for the party!